Brett falls in love on this new single. 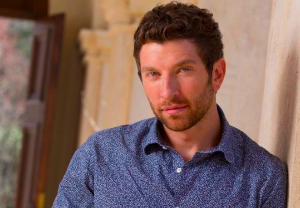 After four straight number ones the last single from Brett Eldredge made it up to #2 on the chart. Sooo close, but that’s how things go and now it’s time to move on to a new single. This one is from Brett’s successful Illinois album. He’s been working his way to becoming a star in country music and if he keeps piling up hits he’ll become a star. Check out this new and see what you think. This one is a little different than the previous singles we’ve had from Brett. He’s had the uptempo and catchy songs along with a few love songs, but this one really brings things down. It’s an intimate song and it comes off pretty well. The theme is love and the way you feel when you’re with someone special. The hook is how love and life can be like music. It’s about how a song can kind of become the emotions you feel and it can represent a point in your life. In this case it’s a guy that wants to be the song that kind of tells the story of the girl. He wants to be the one that she falls in love with for life and he wants her to have a great life and he wants to be part of it all. The song is catchy. The more you listen the more it grows on you. I think this one might be a slow riser on the charts, but eventually I think it’ll get into the top five.